Phil Gawne and Rosemary Clarke were invited to the Fairtrade Foundation’s 20th Birthday Reception at the Queen Elizabeth II Conference Centre in Westminster. The reason? The Isle of Man’s Fairtrade Group had been awarded the Outstanding Project in the twenty years of the Fairtrade Foundation’s existence! 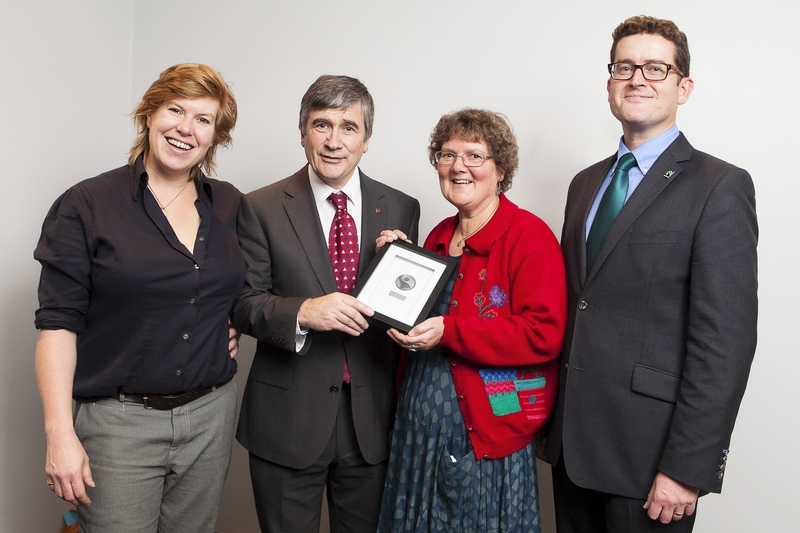 This more formal picture shows Allegra McEvedy (cookery author and broacaster) and Michael Gidney (Chief Executive at the Fairtrade Foundation) with Phil and Rosemary and the award. The Fairtrade symbol is crafted out of Fairtrade silver. the involvement of Government (the conferences take place in the Government Buildings in Douglas with the children using the main chamber for their own debates; Clare Christian, President of Tynwald, welcomed the delegates and assisted with the debates). a range of clear outcomes (one school provided Thought for the Day for the five weekdays of the first week of Fairtrade Fortnight; another developed a Fairtrade assembly to share with a neighbouring schools which had not attended the conference – and which did come the following year; a range of activities during Fairtrade Fortnight.